Walkways or pathways are essential for connecting and creating flow from one element of the landscape to another. They can be very simple or complex, depending on the scope of the landscape design. Most important to remember is that all paths are designed to take us to a destination. Walkways and pathways are made from many types of materials: flagstone or sandstone over sand, flagstone or sandstone over concrete, concrete, concrete with color, colored concrete with texture (stamped concrete), permeable concrete, decomposed granite (aka D.G. ), gravel or pebbles. Even regular sand is used for walkway and pathway surfaces. Brick and interlocking Belgrade pavers are also favorites, due to the variety of colors and textures that they offer. All the above materials can be utilized and combined in many different ways. Imagine a whimsical sand walkway leading to a beach entry pool, or a flagstone path leading to a hidden grotto. Picture a staircase-style walkway taking you upward, then leading you down onto a meandering path made of beautiful natural pebbles and sand to an incredible outdoor landscape. 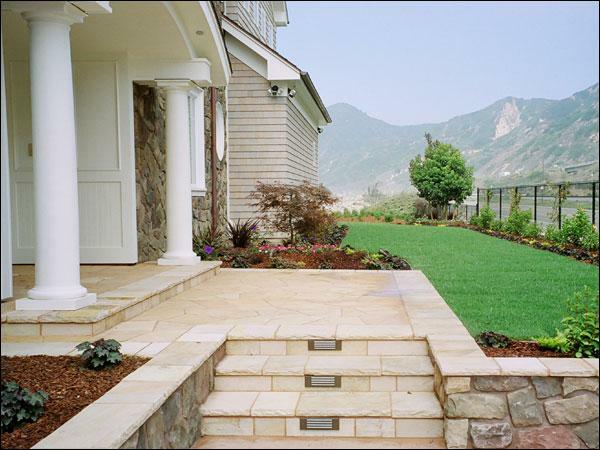 Very often, materials used in walkways and pathways are also utilized on other surfaces. Repetition of a material brings cohesiveness and greater beauty to a landscape. For example, a beautiful Oklahoma flagstone pathway might lead to an Oklahoma pool deck and pool coping, or perhaps the Oklahoma flagstone would be used to veneer the outside of a raised or above ground spa. Or picture a small pebble pathway leading to a beach entry pool finished in a lustrous Pebble Tec or Pebble Fina finish. Walkways and pathways are intended to guide us to many wondrous and beautiful destinations. While we have clients everywhere in South and Central California, we primarily serve Santa Barbara, Carpentaria, Ojai, Ventura, Camarillo, Oxnard, Thousand Oaks, Westlake Village, Agoura Hills and Newbury Park.